The AOS 1355 Air Washer washes and humidifies the air without the use of filters. 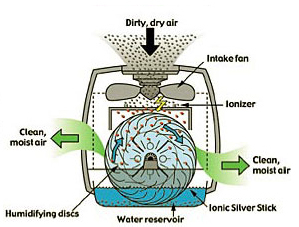 Special humidifier discs turn constantly through water. This method removes many impurities (e.g. dust, pollen and particle-bound odors) from the air - as in Nature, where the rain washes the air clean. The Air Washer works on the self-regulating evaporation principle and thus it requires no additional control systems to ensure optimal air humidity. The AOS 1355 is equipped with a special anti-bacterial protection system. By drawing the air through water, the Air Washer naturally cleanses the air of smallest air borne particles, just like outside air is washed by rain. The air is humidified by special humidifying disks which render traditional replacement filters unnecessary. The self-regulating principal of evaporation guarantees an optimal level of humidity without additional control systems.